Payment via Credit Card, Payment via PayPal and Bank Transfer Payment. 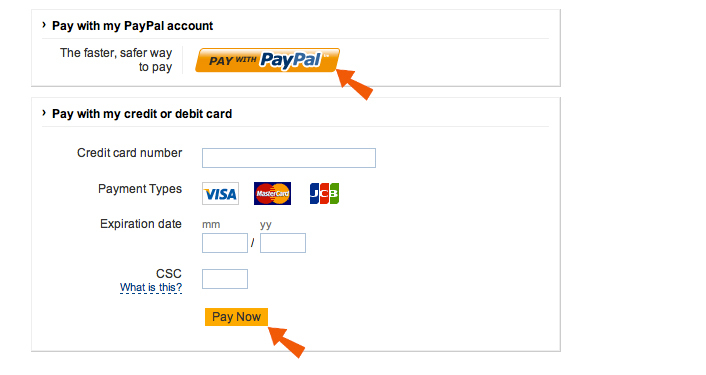 When you select to pay by Card or Paypal account, you will be guided to the following screen as shown below. For Payments via PayPal account, click the 'Pay with PayPal' button and you will be led to the PayPal page, where you will need to log in to your PayPal account to complete the payment. If you do not have a PayPal account, you will be required to create a new account with PayPal. For Payments via Credit Card, after you have filled in your 'Credit card number', 'Expiration Date' and the 'CSC' code, click the 'Pay Now' button below and please wait till you are led to the page that tells you your payment is complete. NOTE: Please do not close your browser until it says that your payment is complete.